Writing for Hackaday isn’t all fun and games; occasionally I need to actually write posts and reply to emails from builders around the globe. Usually, though, I’m knee-deep in a personal project, or just hanging out playing a few video games. Recently I’ve gone off the deep end with Kerbal Space Program, an awesome little space flight simulator set in an alternate reality where everyone is just slightly incompetent. As it turns out, there’s actually a lot of fairly technical objectives in this game, from performing orbital rendezvous to mapping the surface of another planet. It didn’t take long for me to go off the deep end and start mapping the Kerbal moon and turning it into a 3D object. Check out how I did this after the break. [Jim’s] pretty serious about his Etch a Sketch. 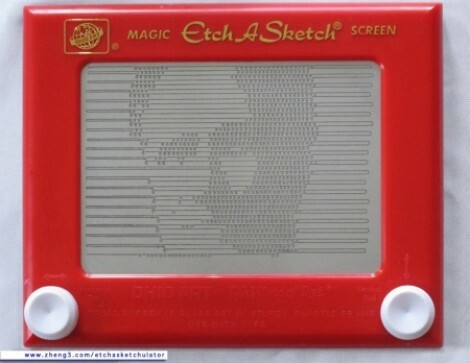 He’s gone to the trouble of building a rig that will automatically render a photograph as Etch a Sketch art. Do you recognize the US political figure being plotted in this image? He actually cracks these open and removes all of the internals to preserve the artwork when the reassembled body is ready to be hung on a wall. But we like it for the hacker-friendly interface techniques he used. He moves the knobs using a pair of stepper motors. They attach thanks to a pair of 3D printed gears he modeled which go over the stock knobs and secure with four set screws. He says he can be up and printing in five minutes using these along with the MDF jig that holds the body and the motors. He converts photos to 1-bit images, then runs them through ImageMagick to convert them into a text file. A Python script parses that text, sending appropriate commands to an Arduino which drives the motors. The image is drawn much like a scanning CRT monitor. The stylus tracks one horizontal line at a time, drawing a squiggle if the pixel should be black, or skipping it if it should be white. We wish there was a video of the printing process. Since we didn’t find one, there’s a bonus project unrelated to this one after the break. It’s an Etch a Sketch clock. [Andy] is getting his garden up and running. This year it’s been pretty cold so he decided to get small plastic domed tunnel which acts as a mini greenhouse. 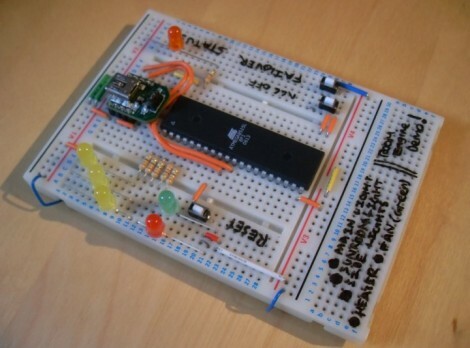 To help monitor that environment he built this sensor array which displays temperature and soil moisture readings. Temperature is quite simple. He’s using a TMP36 sensor which is held a few inches above the soil. The moisture sensor is of his own design. It uses two building screws embedded in foam. These are pushed into the soil and a resistance reading indicates moisture level. By driving voltage on one screw, and measuring voltage on the other he gets some useful data. It’s not a standardized value, but observation over time will let him know how the scale relates to dry or wet soil. During the build process he found that he needed a pull-down resistor on the probe used to take the moisture measurement. He also uses an I/O pin to drive the other screw. This gives him a way to shut off the juice when not taking a reading. We just hope he’s either got a current limiting resistor, or is using a transistor to drive it high. Careful planning and a steady hand let [Leo Rampen] fit everything he needed to build a graphic equalizer display on his LED wall sign. There’s a lot of components that needed to fit on this board, and he decided not use to an etched board for the build. The idea for the project started off as just an LED sign. After spelling out “Sweat Box” using LED rope lights, he needed a way to switch them on and off. But why stop there? He also decided to use an MSGEQ7 chip in the build since the sign adorns their party-room and adding music-based flashing lights seemed like a good idea. He laid out the equalizer chip, ATmega328 (running the Arduino bootloader) and a series of N-channel MOSFETS for switching the LEDS out in Eagle. With design in hand he grabbed a medium-sized piece of strip board and used a drill to cut the traces where necessary. In the end he has a very flashy sign as shown in the clip after the break. 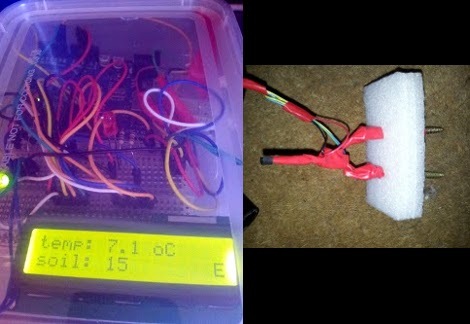 [Joseph] wrote in to share this home automation system he’s working on as a college project. He calls it the Room Engine and the house-side of the hardware is built on top of the circuit you see here. This is the most basic part of the REBoard, which is meant to connect to a computer uses RS232 or USB, and in turn use a set of relays to switch mains voltage devices. You can follow the bread crumb on his webpage to get a broader video of the system. The interface is designed to use two parts. One is a voice recognition system that is supported by the computer. The other is an iOS interface that includes login credentials and a button-based control system. The video after the break shows off the smart phone portion of the controller. We think he’s done a good job of integrating a few appliances without the need for commercial products such as X10 modules. If you’re just interested in switching a few things without cord’s reach of each other this can get it done, and offers scheduling functionality. It would also be pretty easy to set this up with a WiFi module and do away with the PC. Cool picture, huh? 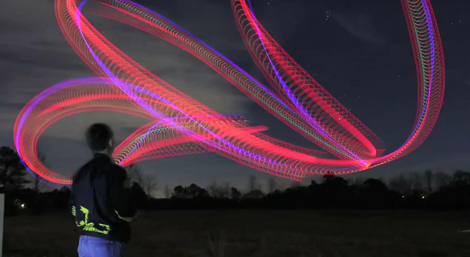 Wait until you see the video footage of this LED-adorned RC helicopter flying on a dark night. But this isn’t an art project. Analyzing the long-exposure photography turns out to be a great way of clearing up some of the physics of flight which otherwise are not at all intuitive. The helicopter used here has different colored lights on the nose and tail, as well as lights on the rotors. Depending on how the aircraft is moving, different 3D spirography is captured by the camera. When you zoom in on part of the flight path it becomes clear that there are wider arcs on one side of the fuselage than there are on the other. This has to do with the forward progress of the aircraft and the rotation of the blades. The phenomenon is well known by helicopter enthusiasts, and accounted for in the design. But what we didn’t realize is that it actually translates to a theoretical speed limit for the aircraft. Our childhood love of Airwolf — the TV helicopter that could outrun jets — has been deflated. You should remember the helicopter physics videos featured here last month. This is the latest offering and we’re still wanting more! 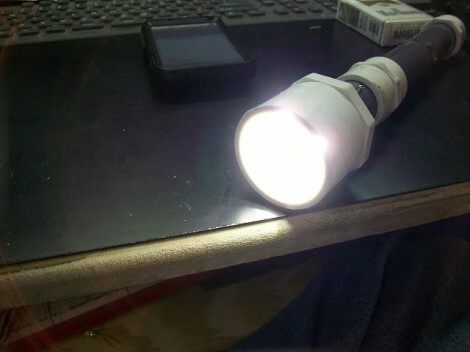 This isn’t a brightest flashlight in the world type of hack (but it does manage to push about 1000 lumens). [Stephen Webb] is finding a use for leftover parts by building his own simple LED flashlights. As you can see, he uses PVC parts available at any hardware or home store. These are a good choice; they’re cheap, light weight, resilient, designed to be water tight, they easily thread together and have connectors that reduce the diameter of the fittings. The electronics use standard size cylindrical Lithium cells. These are found in many types of Laptop and Power Tool batteries. Often when one of those battery packs bites the dust it’s an issue of one or more bad cells. 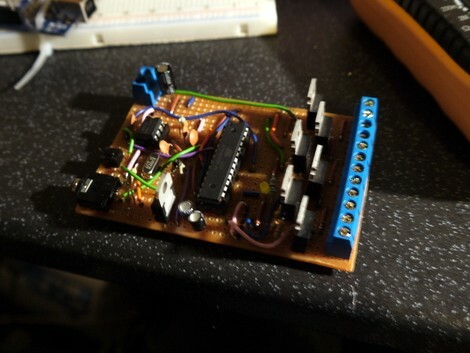 [Stephen] desolders the cells, and reuses the good ones in this project. We didn’t see any mention of a recharging technique. Does anyone have any advice on how to top these cells off if they’re not in their original power pack form?